The University of Oxford was the first university in the English-speaking world and remains at the forefront of centers of learning, teaching and research. Students from more than 140 countries and territories make up a student population of over 23,000, including 11,747 undergraduates and 11,687 postgraduates. More than half of undergraduates are studying for degrees in the humanities and social sciences, and 44 per cent in the medical, mathematical, physical and life sciences. The remainder are studying for undergraduate-level diplomas and certificates offered by the Department for Continuing Education. Oxford was ranked first in the world in the Times Higher Education (THE) World University Rankings for 2017 and 2018. It offers more than 350 different graduate degree programmes. Five percent of all the UK’s graduate research students are studying at Oxford University, and according to the 2014 Research Excellence Framework, the official UK-wide assessment of all university research, Oxford has the largest volume of world-leading research in the country. The tutorial is at the core of undergraduate teaching and learning at Oxford. It offers students a unique learning experience in which they meet regularly with their tutor, either on a one-to-one basis or with one or two other students. Undergraduates attend, on average, one hour-long tutorial every week and undertake a considerable number of hours’ preparatory work for each tutorial, including background reading, essay-writing and problem-solving. The university has 38 independent and self-governing colleges, and 6 permanent private halls. The collegiate system is at the heart of the university’s success, giving students and academics the benefits of belonging to both a large, internationally renowned institution and to a small, interdisciplinary academic community. Colleges bring together leading academics and students across subjects and year groups, and from different cultures and countries. All colleges accept both men and women. 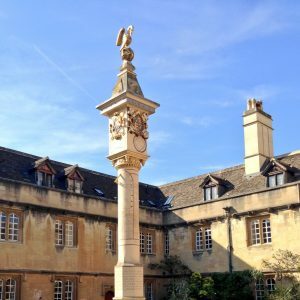 The university’s oldest colleges are Balliol College, University College and Merton College, all of which were established by the 13th century. Oxford’s academic staff come from almost 100 different countries and territories. The largest groups of international academic staff are from the USA, Germany, Italy, China, Australia, France, Ireland, India and Canada. The university, including the colleges and Oxford University Press, is the largest employer in Oxfordshire, supporting around 17,000 jobs and injecting more than £750 million annually into the regional economy. Oxford’s academic community includes over 80 Fellows of the Royal Society and over 170 Fellows of the British Academy. In 2018, six Oxford professors were elected to the Fellowship of the Royal Society. In 2018, two Oxford professors were elected to the Fellowship of the Academy of Social Sciences. In 2018, seven Oxford professors were elected to the Fellowship of the Academy of Medical Sciences. In 2017, eight Oxford professors were elected to the Fellowship of the British Academy. In 2017, four Oxford professors were elected to the Fellowship of the Royal Academy of Engineering. Oxford University has won ten Queen’s Anniversary Prizes for Higher Education, more than any other university. The most recent prize was awarded to the Institute of Biomedical Engineering in 2015. Oxford was ranked first in the world in the Times Higher Education (THE) World University Rankings for 2017 and 2018. In the THE subject rankings for 2018, Oxford is, for the seventh year running, ranked first in the world for Clinical, Pre-Clinical and Health subjects. It is also ranked first in the world for Social Sciences; third in the world and first in the UK for Computer Science, for Engineering and Technology, for Education, and for Business and Economics; third in the world and second in the UK for Life Sciences; fourth in the world and first in the UK for Arts and Humanities; and sixth in the world and second in the UK for Law. Oxford is ranked first in the world in Arts and Humanities in the QS World University Rankings by Subject 2017. It ranks third for Life Sciences and Social Sciences, fifth for Natural Sciences, and ninth for Engineering and Technology. Oxford is ranked sixth in the world in the QS World Rankings (2017) and seventh in the world in the Academic Ranking of World Universities compiled by Shanghai Jiaotong University (2017). Oxford is ranked second in the UK by The Sunday Times (2017), The Guardian (2017) and The Complete University Guide (2017). The information above is provided by the University of Oxford.